Personality: Tenebris is an enigma, his traits and attributes have lead to his own egotism from his humble beginnings to his position of leading the Ebonwing Potentate. Reserved and aloof, one’s first impression of Tenebris would be of his cold, distant and apathetic mannerisms. Eerily detached from normalcy Tenebris separates himself from normal society, being far more austere and calculating than most Dragons within the world. Despite his formalities and seclusion Tenebris can be very charismatic as it exacerbates from his idealistic notions and ideals. With his supernatural impeccable charm he carries himself with an air of ethereal grace which reflects in his hidden passionate personality. Despite his foreboding appearance and presentation Tenebris believes wholeheartedly that everything he does is for the greater good and for his subjects. Convinced that his shrewdness is for the purpose of bringing peace and prosperity for all, Tenebris although rarely seen outright is in service to the betterment of all Dragonkin, often taking a keen interest with those less fortunate than himself. For all his wit and cleverness with words Tenebris is often referred to as a silver tongue, whose ability to speak, deceive and manipulate his opponents is legendary. His capacity for cleverness and way of words is only matched by his limitless ambitions for greatness which again is derived from his belief that only his actions are in the interests of his fellow Dragons. Tenebris at times has even proven himself to be empathetic to those in a lesser position than him and particularly to those in need who are helpless feeling pity upon them. Outside of his own subjects and the Potentate, Tenebris does degrade other Tribes and species but instead believes their leaders are short sighted and initially corrupt. At home with heady blend of power, intrigue and romanticism he often find himself at the courts of other rulers to influence and manipulate topics and events into his favour, which again he believes would be for the benefit of all. Interests: Alchemy, Politics, Science, Reading, Lectures, Order, Discipline , Magic, his Kingdom and people. Finally his family. Dislikes: Inability to do anything, warmongers, short-sighted Dragons, those who undermine him. Height: Fifty Foot, his large Wingspan can double his size casting a shadow to blot out most subjects of interest behind him. 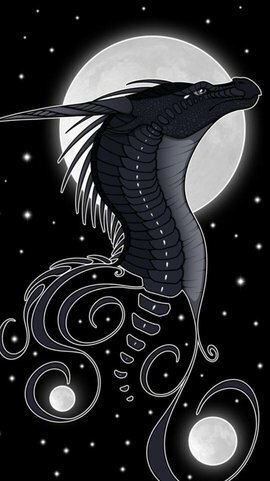 Scales: His hide is a dark onyx along with his obsidian black horns, while his underbelly would seem to be an almost black violet. The membrane of his wings although sharing the same shades and dark hues of his hide have a bizarre speckled effect of silver which seem like they imitate the stars of the night sky against the rest of his brooding shadow like appearance. Eyes: A cold eerie sapphire blue which would appear almost metallic. Appearance: Typically a western Dragon, a lean neck runs down from Tenebris’s head and into his muscular yet slender body. The top is covered in thick midnight scales and a row of ridge like spire growths runs down his spine to the tip of his tail, while the bottom underbelly is covered in smooth skin and is coloured slightly lighter than the rest of his body. Four mighty limbs carry his body and allow Tenebris to stand elevated and dignified. Each limb has five digits, each of which end in large crooked talons seemingly made of onyx. Weary but wide cobalt eyes sit concealed within Tenebris’s hard, scaled skull, which gives him a fierce foreboding appearance. Two ebon large horns sit atop his head, just above his short, warped ears. His nose and maw is long with two short, curved ridged nostrils and a well defined jawline what many would consider charming and handsome. Due to Tenebris’s fixation with Magic and his adapt practises, he has recently begun to show the signs of affliction in Magical deterioration. Despite his well toned body and shape, his physical strength has been drastically drained which is show from his weary sunken eyes what often appear bloodshot. 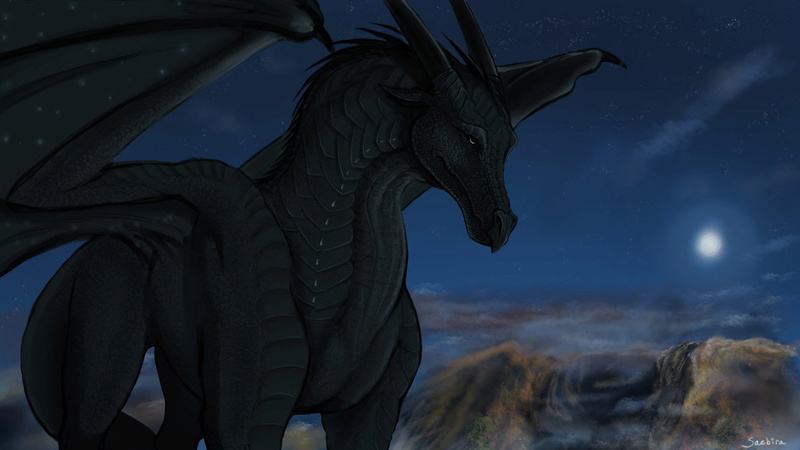 Outside of his court appearances Tenebris is often seen dragging his tail and during flight usually relies on wind currents to provide him lift and merely glides, the speed of which he can do on his own is highly restricted from usually Nightwings and Ebonwings averaging out at only about 50 mph in flight. Family: To Tenebris’s knowledge all his blood relations are dead, in a clutch with four other stillborn hatchlings Tenebris could of had four brothers or sisters if fate wasn’t cruel. 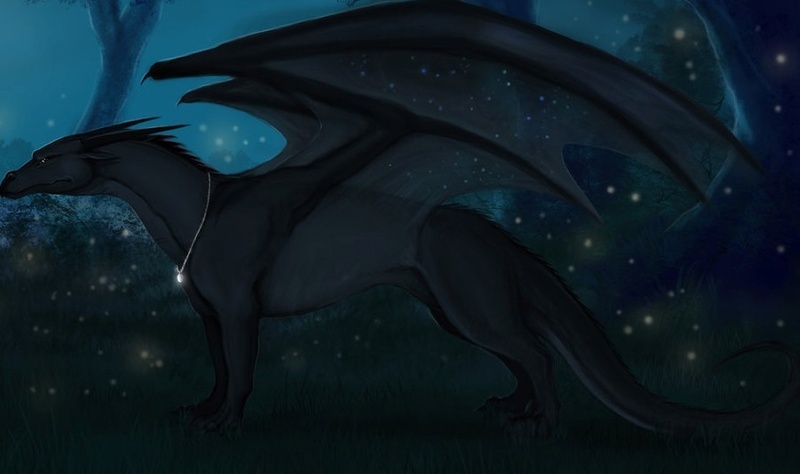 With no hatchlings of his own Tenebris has taken three young Dragons over the years under his wing and raised them as his own; Vesanus, Celestia and Lacrimosa. Tenebris also acts at times as a surrogate father figure to his protegé Loque. Strengths: Tenebris’s traits regarding his strength rely heavily upon his keen intellect and cunning. His ability to outwit his enemies through the use of strategy and the limited aerobatic skill he possesses due to his slowly speed. Often attempting to nimbly dodge his enemies as he lacks much of his former physical prowess from his youth. What Tenebris uses to his advantage through to gain the upper hand is his use of the Sleeping gas Nightwings emit through their breath which he produces like a veiled mist around the immediate area of several feet. Finally as a practitioner of magic Tenebris places several wards around himself during combat to warp his enemies perception. Special Abilities: Dream weaving and manipulation. Tenebris can use his dream weaving for good or ill. He can make contact with those he knows over great distances even in sleep as a form of communication and can weave dreams of peace and prosperity. In the same essence however Tenebris can can weave so much more upon his enemies, when the victim turns to enter a deep slumber for the night, the Dreams once under Tenebris influence can vary to his will. They can come in the form of darkness overpowering and absolute with no peace, only horror and empty within an unbearable dread. These Dreams develop into images of death and so profound that all fears terrify those who are unfortunate to obtain the curse as they manifest into grotesque imagery to ensure restless nights. The anguished wails of abominations and loved ones can lead to plaguing those even in waking, the anxiety and sleeplessness caused by the Nightmares forever assaulting them. Weaknesses: Tenebris's lack of physical robustness and over confidence.